Materials of construction used for the interiors of new fume hoods or for the modification of the interiors of existing fume hoods should have a flame spread index of 25 or less when tested according to NFPA 255, unless the interior of the hood is provided with automatic fire protection. Baffles should be constructed so that they are unable to be adjusted to materially restrict the volume of air exhausted through the fume hood. 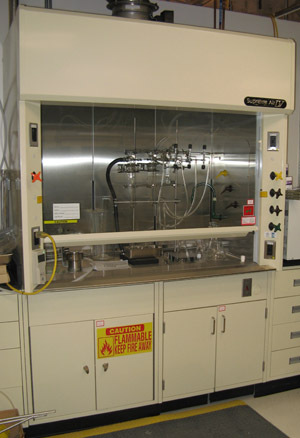 Use of liquid hydrogen with a fume hood is not recommended because the very large liquid-to-gas expansion resulting from a spill will most probably overwhelm ventilation, lead to formation of a sensitive mixtures, and within the confined space of the exhaust system result in a high probability for accelerated flames and detonation. To protect personnel, remote operation is strongly recommended, and the high risk for large overpressures and flames must be accepted. Remember, the strategy of ventilation is to always control mixing of exhausted gases to below a quarter of the LFL, otherwise venting is required. Fume hood sashes should be kept closed whenever possible, and they should always be fully closed when a fume hood is unattended. Fume hoods should be installed in a manner that prevents fire or smoke from a fire in the fume hood from spreading into the voids above the ceiling. For new installations or modifications of existing installations, controls for fume hood services (e.g., gas, air, water) should be located external to the hood and within easy reach. In installations where service controls are within the hood, additional shutoffs should be located within 50 feet of the hood and should be accessible and clearly marked. A measuring device for hood airflow should be permanently installed on each fume hood and should provide the hood user with constant indication of adequate or inadequate hood airflow. Emergency shut-down procedures should be posted and visible. An automatic shutdown mechanism should be installed to shut off the flow of hydrogen gas in the event of loss of fume hood air flow if an LFL quantity of hydrogen could accumulate. Fume hoods should be located in areas of minimum air turbulence. Fume hoods should not be located adjacent to a single means of access to an exit or to high-traffic areas. Work stations not directly related to the fume hood activity should not be located directly in front of fume hood openings.